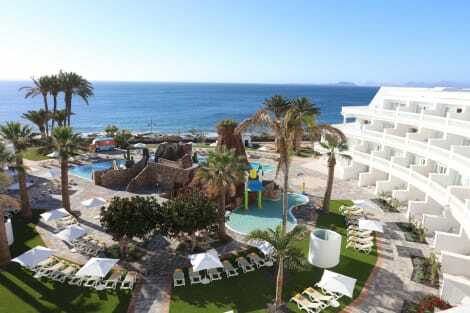 Ideal for families, the THB Tropical Island is a 4-star resort in Playa Blanca on Lanzarote’s south coast. The resort has 14 swimming pools, including several especially for children, outdoor Jacuzzis, an adults only area, a spa, entertainment, sports and diving facilities, several bars and restaurants and an on-site supermarket. The resort’s apartment-based accommodations have terraces or balconies, kitchen facilities, living areas, wi-fi, flat-screen TVs and safes. Labranda Alyssa Suite Hotel 4*, offers incredible views to the islands of Fuerteventura and Lobos. It has an exceptional location in the residential area of Montaña Roja. It has a relaxing and calm environment, ideal site for resting. Playa Flamingo is only 1.5 km far and the town centre is 2.6 km. Labranda Alyssa Suite Hotel 4*occupies a wide plot of 38.000 sqm. We can find the Reception, the bar and the restaurants at the main building. The pool area has 3 natural freshwater pools: 2 for adults and 1 pool for children. 2 types of rooms: Suite (1 room), Suite (2 rooms). The Hesperia Playa Dorada is just off the Costa del Papagayo, an idyllic destination for recharging your batteries. Set in lush green gardens, this modern hotel is surrounded by azure water, blue sky and white sands. Each room has its own private terrace, plenty of natural light and free wi-fi. Cool down in one of five swimming pools, play tennis or unwind with a refreshing cocktail. Overlooking the Atlantic Ocean, this picturesque 5-star hotel in the fishing town of Playa Blanca is a great place to unwind. This all-inclusive resort is wonderful for families, with a children’s entertainment programme, five adult swimming pools and three kids pools as well as a Health and Beauty Centre. At the H10 Rubicón Palace there’s something for everyone. The resort also has four restaurants and three bars as well as a discotheque. Set on Las Coloradas Beach, Sandos Papagayo Beach Resort offers all-inclusive services 24 hours a day. It features 3 outdoor pools, a spa, and rooms with balconies with views of the sea, Lobos Island and Fuerteventura. Each room at Sandos Papagayo Arena has satellite TV and air conditioning. Safes and minibars are available to rent.The hotel has 5 bars and a nightclub. On-site restaurants include an international buffet, a pizzeria, Fusion restaurant where you can enjoy of asian or tex-mex dinners and also the Royal Elite restaurant for those who booked a Royal Elite room .Hotel Sandos Papagayo’s spa includes hot tubs, saunas and a steam bath. There is also an on-site gym, a mini-golf course and a multipurpose sports pitch.The hotel staff organise sports, activities and evening entertainment. Children can enjoy the play area, children’s swimming pools and kids’ club.Located 600 metres from Papagayo Beach, the hotel is 4 km from the fishing village of Playa Blanca. Timanfaya National Park is 20 km away. The following charges are included in the overall price of the room: Christmas gala buffet lunch (on December 25th) and New Year’s Eve gala buffet dinner (31st December). 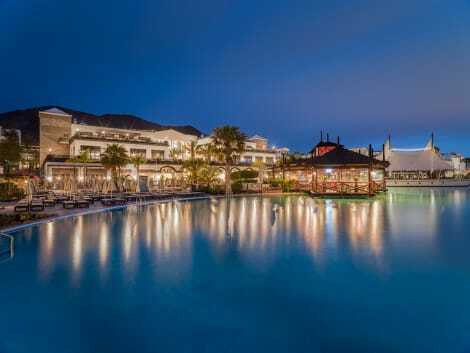 Hotel THe Volcán Lanzarote In the south of Lanzarote, the island of volcanoes, stands Hotel THe Volcán Lanzarote: a five-star complex that stands out for its excellence and enjoys a privileged location. With Marina Rubicón marina at your feet and overlooking the sea, you will find this spectacular hotel designed as a typical Lanzarote town. In it you can not only admire the architecture characteristic of Lanzarote. In addition, you will discover faithful displays of emblematic corners such as the church of Our Lady of Guadalupe in Teguise at the entrance, or La Geria in the solarium. Hotel THe Volcán Lanzarote has a total of 255 rooms, five swimming pools, four restaurants, three bars, conference rooms, spa area and gym. In addition, at Hotel THe Volcán Lanzarote you can enjoy a new concept of exclusivity in the Club Volcán, area for adults only. 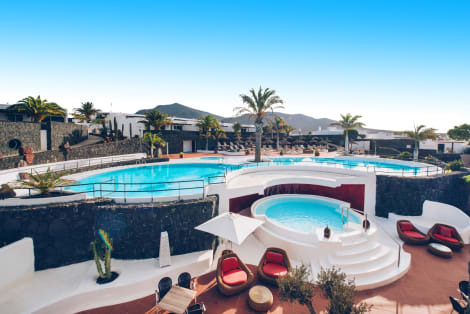 Hotel THe Volcán Lanzarote offers you a wide range of entertainment, sports activities, leisure and relaxation, offering an exquisite treatment and service. Also, you can access directly from the hotel to Puerto Marina Marina Rubicon, which has a large shopping area and leisure. Elegant and with a stunning Mediterranean setting, the 4-star all inclusive H10 Sentido White Suites is a boutique hotel close to shops, beaches and a national park. Designed to be the perfect sunny sanctuary, this TripAdvisor Certificate of Excellence winner has a list of on-site features to cover all needs, with a pool, beauty centre, gym, business centre, free wi-fi, two restaurants and two bars. All rooms have air conditioning, LCD TVs, iPod docking stations, and Nespresso machines. Set in Lanzarote’s Playa Blanca, Marconfort Atantic Gardens Adults Only is an exclusive complex that offers a swimming pool with climate control, buffet restaurant, snack bar, and fitness centre.Featuring a typical Canarian décor, this complex offers bungalows with a private terrace with outdoor furniture, and living space with a sofa bed, safe, and flat-screen TV. The bedroom comes with 2 single beds and a private bathroom with a shower.There are many activities you can practice in this hotel, including mini golf, tennis, and volley ball. There is a gym and solarium available, and guests have access to a sauna for an extra charge. Free WiFi is available in all public areas.The buffet-style restaurant serves international dishes, and it includes a terrace for al-fresco dinner. There is also a snack bar offering drinks and cocktails, and you can enjoy live music at night. The following charges are included in the overall price of the room: Christmas gala buffet lunch (on December 25th) and New Year’s Eve gala buffet dinner (31st December). 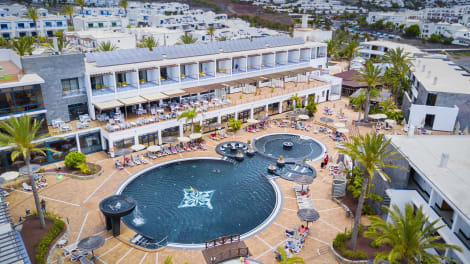 Hotel THe Mirador Papagayo, located next to Playa de las Coloradas and very close to the paradisiacal beaches of Papagayo, is the ideal place to enjoy a family holiday in Lanzarote. This 4-star resort has 291 spacious rooms spread over two 3-storey buildings. It also has two swimming pools for adults and two children, restaurant, snack bars and a convention room. The wide range of entertainment, sporting activities, leisure and relaxation has been designed so that each member of the family enjoys the most of this experience. For this, Hotel THe Mirador Papagayo has among others a gym, a spa center, a multipurpose sports court as well as bicycle and kayak rentals. Of course, the little ones will have a great time in our Mini Club for children. The island of Lanzarote, with its tourist attraction and good infrastructure, is an ideal setting for events of different types such as weddings, congresses, conferences and company meetings. Hotel THe Mirador Papagayo offers modern facilities with equipment for holding such events. With breathtaking views of the island of Lanzarote, Fuerteventura and Isla de Lobos, here you will have everything at your disposal for a vacation to your measure. Discover with Hotel THe Mirador Papagayo a universe full of small pleasures. An unforgettable experience to share in the best company in a unique environment. Between the beach and the centre of Play Blanca, the lovely 4-star H10 Lanzarote Princess hotel enjoys a privileged position in the town. Comfortable and neat air-conditioned rooms have a balcony or terrace and you can access free wi-fi from the hotel lobby. Enjoy food from Yaiza Restaurant and keep entertained with the resorts fun daytime and evening entertainment. Great for families, there is a kids’ club, pool and play area. Standing just 50m from the magnificent Flamingo Beach and 1 km from the fishing village of Playa Blanca, this superb hotel is the ideal choice for a family holiday. 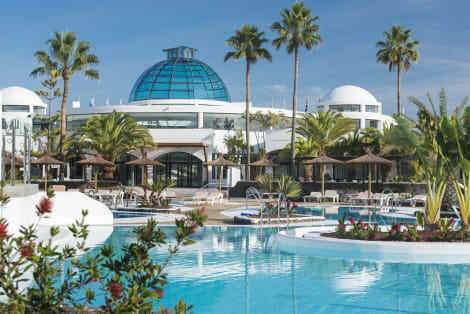 The IBEROSTAR SELECTION LANZAROTE PARK complex boasts 7 pools, a solarium-terrace with hammocks and sunshades, an outdoor terrace with a grill restaurant and numerous sports facilities including tennis courts and a fitness room. Make yourself at home in one of the 47 air-conditioned rooms featuring kitchenettes with refrigerators and microwaves. Rooms have private balconies or patios. Wireless Internet access (surcharge) keeps you connected, and satellite programming is available for your entertainment. Conveniences include safes and coffee/tea makers. Swimming pool for adults, exterior jacuzzi, Swimming pool for children, a covered heated swimming pool (during winter), a large solarium with sun beds and sunshades (free of charge) and garden areas. Individual access to the Internet. Rubimar Suite has a sauna, Turkish bath and interior and exterior Jacuzzi (in the centre of the swimming pool), ideal to enjoy a relaxing evening. The hotel is equipped with a tennis court, a paddle tennis court and a gym so that you can keep fit while you relax or have fun. Also there is a Children's Playground situated on the sun terrace areas to allow the children to play and enjoy themselves in safe surroundings. ** Some of the services has an extra charge, please check at the reception. Standing next to the fabulous Papagayo beaches, this magnificent complex offers guests the chance to enjoy the natural settings of this island. The hotel boasts 48 luxurious bungalows standing in well-kept grounds featuring two pools, a Jacuzzi, children's play areas and large terraces with hammocks, sunshades, benches and Bali beds. A fabulous range of culinary and sports options adds the perfect finishing touch to this unique holiday experience on Lanzarote. This family-friendly hotel is located in the fishing village of Playa Blanca, in the south of the Canary island of Lanzarote. The town centre offers an array of shopping and entertainment opportunities and, like the beach, lies some 800 metres from the hotel. Links to the public transport network can be reached in about 600 metres, and the island capital, Arrecife, lies about 40 km away. This comfortable hotel provides guests with an abundant supply of facilities. A café, a bar, and a restaurant which offers international cuisine, show cooking, and themed evening are all available at this establishment. Guests may also make use of the Internet access, the medical service and the bicycle hire facility. The spacious rooms are fitted in a modern style and come with a combined lounge and dining area. When you stay at Relaxia Lanzasur Club in Yaiza, you'll be near the beach, a 1-minute drive from Aqualava Waterpark and 9 minutes from Marina Rubicon. This family-friendly apartment is 12.2 mi (19.7 km) from Timanfaya National Park and 6.7 mi (10.8 km) from Papagayo Beach. Make yourself at home in one of the 53 air-conditioned rooms featuring kitchens with refrigerators and ovens. Your bed comes with premium bedding, and all rooms are furnished with unspecified sofa beds. Complimentary wireless Internet access is available to keep you connected. Conveniences include phones, as well as microwaves and irons/ironing boards. This property is 8 minutes walk from the beach. 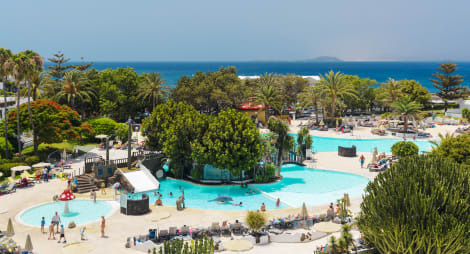 Set in Playa Blanca, Lanzarote, and designed as a typical Lanzarote town, Elba Lanzarote Royal Village Resort is located a 15-minute walk from Flamingo Beach. This property offers free WiFi throughout. This complex offers air-conditioned rooms with satellite LED TV, safe, minibar, coffee and tea service, and fan. The private bathroom includes a spacious shower, hairdryer, and magnifying mirror. There are 4 restaurants on site, with options of a la cartè menu and buffet options. A pool bar is also available to all guests. The hotel has several pools, including waterfalls and a children's area, as well as a solarium with sun beds. There are several on-site activities such as football, tennis, and volleyball, including a gym with yoga, Pilates, and Zumba lessons. There is also a spa with different treatment options and services. Playa Blanca is a 5-minute drive from Elba Lanzarote Royal Village Resort. Timanfaya National Park is 10 km away. Lanzarote Airport is 28 km from the property. 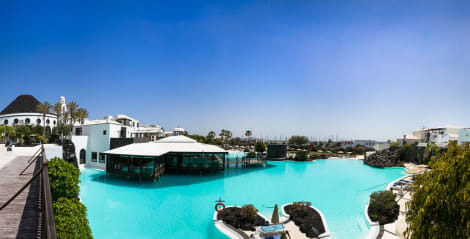 Lanzarote's most southerly resort, Playa Blanca is a luxury, modern holiday town that overlooks a superb sandy beach and is known for its particularly international atmosphere. Like all other holiday destinations on the Canary Islands, the resort is generally warm all year round and is a popular winter retreat for many tourists from Northern Europe. Probably the most historic sight in Playa Blanca, the Castillo de las Coloradas is renowned for its sea views and is a popular local visitor attraction. The building, which dates back to the 18th century, was an important lookout for pirates, and is next to the glorious sands of Las Coloradas Beach. There is probably no other place on Lanzarote that could be more perfect for a day trip than the Timanfaya National Park. This extraordinary volcanic landscape, which has also been named the Montañas del Fuego (Fire Mountains), was created almost 300 years ago, when dozens of volcanoes struck the island and drastically altered its physical make-up. The park is famed for its El Diablo restaurant, which cooks fantastically flavoursome Canarian recipes with a unique geothermal heat method and offers phenomenal views of the volcanic scenery. The capital of Lanzarote since the mid-19th century, Arrecife is a strategic port just a few miles from the island's international airport. Arrecife is also home to the enchanting Castillo de San José fortress, which was also designed in the 18th century and, like Playa Blanca's Castillo de las Coloradas, was built to defend the island from imminent pirate invasions. This unique lava tube, which was formed around 1000 BC, is regularly open to the public and contains a special concert hall that can accommodate several hundred people. The Cueva de los Verdes was created by the Corona Volcano, and comprises a formidable cave system that includes a special 'Tunnel of Atlantis' section more than 9km long. For a very affordable, beautifully landscaped resort, choose the H10 Rubicon Palace, or consider the exclusive Princesa Yaiza Suite Hotel Resort if you're looking for outstanding hospitality. Other highly rated Playa Blanca hotels include the majestic Dream Gran Castillo Resort and the contemporary, elegant and value-for-money SENTIDO H10 White Suites. You can enjoy some tasty, traditional English recipes at The Port of Call, or treat yourself to some delicious hamburgers at Chacho Fresh Burger. For some inspiring Portuguese dishes, head to the Atlantico Bar Restaurant, have some mouthwatering Italian food at Casale Franco, or enjoy some excellent seafood, Spanish recipes and international-themed dishes at Blue Note Lanzarote.